Mixed in with the usual garden chores around the home, should be paying close attention to what the wasps are doing. Here a queen yellow jacket is scouting for a spot to start her nest for the year. Discouraging them now can save you the trouble of getting stung later. Should you see them digging in the ground or walking about mulch and leaf litter, simply rustle things up in the area. They're usually good enough to fly off and find somewhere else. I've already discouraged two queens from setting up shop in my yard, though there might still be one in the mulch pile I need to locate. 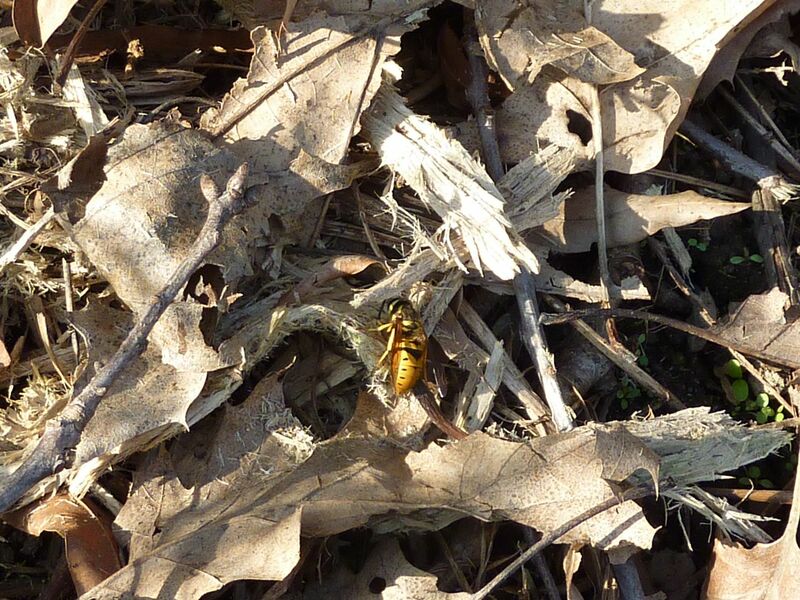 Along with yellow jackets, keep an eye out for European Hornets which are also scouting around now. Queens are about twice as big as a Boring Bee, and seem to rival the size of a Hummingbird. While a few wasps aren't bad, they can be devastating to butterfly gardens and will clear out all the caterpillars on your host plants.